I've been invited by Farfetch.com to take part in their exclusive competition "Style is Eternal" that celebrates the opening of "Yves Saint Laurent: Style is Eternal" exhibition at the Bowes Museum. 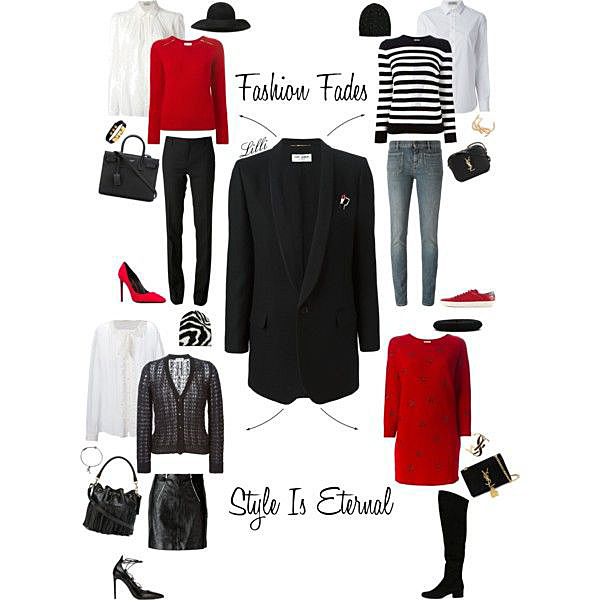 What Farfetch asks is just to style the iconic Saint Laurent Le Smoking tuxedo jacket, creating a fashion set that only features Saint Laurent items and that is inspired by the designer's famous quote ‘Fashion Fades, Style is Eternal’. Wish me luck and enjoy the weekend! Love the styles that you created around the smoking jacket. Good look with the competition. You deserve to win! I've tried to choose one favourite but it's really hard! :) All of this outfits looks great! So I'll admire all of it! Is there any competition? Is there anything I can do to give you my support? :) Just let me know! Good luck, dear! The coat is gorgeous. These are great and classic options. I always love a beautiful monochromatic look, with a dash of red thrown into the mix. Happy weekend Lilli. This has got to be one of the prettiest and chic look that I have seen for the competition! I hope you win, Lilli cause this look is smouldering hot! Ottime proposte, rosso e nero un abbinamento perfetto! The YSL smoking jacket really is such a iconic piece and I love how you did a classic take in styling it it both up and down. Good luck with the competition Lilli! Have a wonderful weekend. Adoro la giacca smoking, un must-Have... bellissimi i set che hai creato!!! Nice!! I love your set, Lilli! Ottime proposte cara Lilli! Un bacio. I admire Yves Saint Laurent. He is so talented and chic. I like the black, red and white combination. So fashionable! Have a wonderful weekend Lilli. I love your edit Lilli, the touches of red and the stripes are so classically Saint Laurent. Good luck! I haven't been here for a long time. I've been bz with work and new home and I really miss the blogging sphere. Feels good to have some time to catch up on all your blogs! Gonna look through all the posts that I've missed. I love what you've put together, Lilli. So versatile. I hope you win! I didn't know what a smoking jacket was and had to google it. Wow! !I really love them all!Great outfits! Good luck with the competition sweet Lilli! You really made this amazing jacket come to life with these fabulous outfits! Every outfit is so classic and I love that you stuck with red white and black! Amazing combinations! I am sure they will love your entry! I am agree with you, this jacket is basic in anything wardrobe, you chose nice elements for complement them, happy start of week Lilli! Lilli ma uffa! Mi piacciono tutti! Lovely selections; I wish you luck in the entry Lilli. Yves Saint Laurent is certainly one of my most favorite designers and fashion houses! Laurent always has so many classy and timeless pieces that you can wear for many, many years! Brava Lilli, mi piace il set, la giacca smoking e' sempre un must, così versatile ed adattabile a molti stili e occasioni ! Good luck! You did a fabulous job with this board Lilli. It's a gorgeous jacket and I love the outfits.